The Mitel 3000 Display Phone is a digital telephone with 8 programmable keys for access to the features you use most. The Mitel 3000 also provides display-driven menus, caller ID information and speakerphone functionality, creating a productive call handling environment. This Mitel 3000 display phone offers 16 programmable keys, soft keys to easily navigate the menu-driven display and enables an ECX DSS (Direct Station Select) connection for advanced communications. 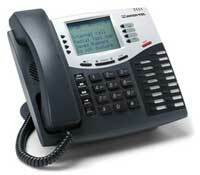 The INT1400 cordless phone that has many of the same features as the ESX 1000 and 2000. Features include: one touch access to four lines, full system feature access, 900Mhz frequency, and up to a 500 foot range depending on environment.